Pool fountains and waterfalls really up the wow factor of your pool. With the pool season just off the horizon now is a good time to consider adding any new features to your pool. One feature that adds plenty of excitement and maybe ever a little flair is a pool fountain or waterfall. 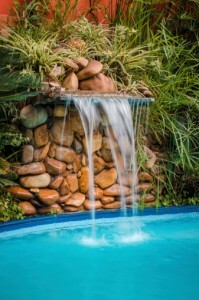 Why is a pool fountain or waterfall such a great addition to your pool and landscape? Keep reading to find out. One of the biggest reasons people install pool fountains or waterfalls is the aesthetic appeal they add to a pool and the greater landscape. From natural waterfalls that blend into your landscaping to sheer descent waterfalls that emerge from your hardscaping, waterfalls can be built in many different ways. Whichever fits your landscape, it’s sure to become the focal point of your whole yard. Aside from looking great, pool fountains and waterfalls bring that amazingly relaxing sound of running water home. Whether splashing around yourself or sunbathing on the pool deck, the sound of running water supplies a calming backing track. Plus, it’s a little known fact that that pool fountains and waterfalls can help cool your pool water throughout the long hot summer months. Once you’ve decided on fountain, why not go the extra step and add exciting LED lights? Magicstream Laminars are a great way to add a bit of flair to your fountain by creating brightly lit streams of water from your pool deck into your pool that can change colors to suit your yard. Waterfalls are a natural choice for lighting since they’re already going to be a big focus of your landscape. Colored LED lights help change the look of your waterfall while highlighting it. 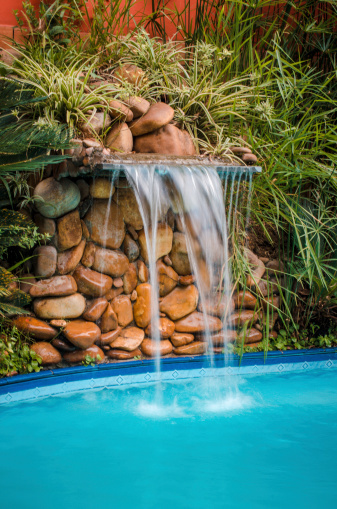 Let Paradise Pools Install a Pool Fountain or Waterfall in Your Pool! This entry was posted on Friday, February 10th, 2017 at 11:49 am. Both comments and pings are currently closed.